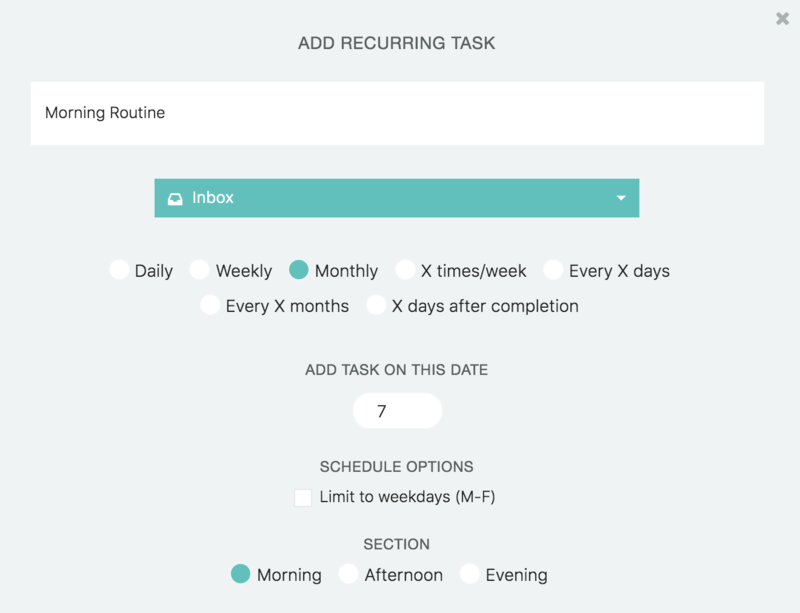 In the edit dialog for the recurring task you can set which section the recurring tasks should show up in. You can only pick from the sections that you have currently enabled. However, it saves all your picks. So if you frequently switch between using the "Break the day down" and "Custom sections" for example you can turn each strategy one and go set the section for your recurring tasks. When you switch your section strategy in the future, the recurring tasks will always know where to go. It is currently not possible to assign recurring tasks to time block sections. This is because time block sections are "dynamic" and changing from day to day. But this will be possible in a future update as we launch the new and smart time blocking system.